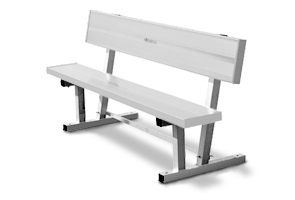 Extremely rugged multi-purpose players benches. Seat and back planks are 2" x 10" etched and clear anodized aluminum. The frames are 2" x 2" tubular aluminum. The height from ground to seat is 17". These versatile benches can also be permanently mounted.